BEIRUT: Prime Minister-designate Saad Hariri remains the strongest Sunni leader despite a decline in his political power, according to Lebanese President Michel Aoun. “The prime minister, whether it is Hariri or anyone else, must be strong and should not be weakened,” Aoun said. The disagreement centers on a demand by Hezbollah for one of its Sunni allies to be given a portfolio in the 30-seat Cabinet to reflect gains the group made in the May 6 elections. He said: “The group that now demands a representation in the government amounts to individuals, not a bloc. We represent blocs according to certain criteria. They have formed a group, so can they have a Cabinet post when each of them has a different political orientation? Aoun’s stance drew praise through Twitter from Hariri, who described the president’s words to the Lebanese people as “the epitome of honesty, frankness and responsibility. “With you, we will not retreat from our march toward the advancement of Lebanon,” Hariri said. 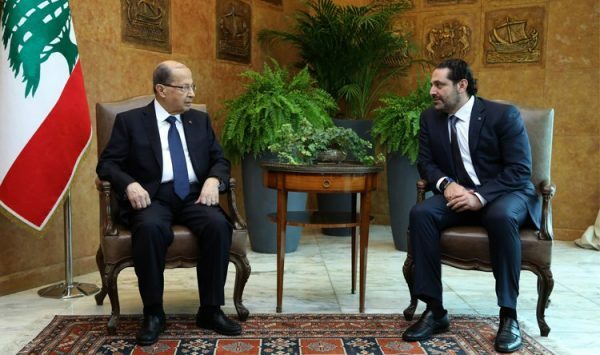 The comments by Aoun and Hariri coincided with a warning by the interior minister in the caretaker government, Nohad El-Machnouk, over Hezbollah’s demand. Machnouk said that “the large reservoir that is called the national responsibility of the Sunnis has begun to run out after it has been drained — I do not wish to say blackmailed. We are not the only ones responsible for and concerned with the covenant. “Every day they lay a new mine and create new standards which they apply selectively … yet contradict them elsewhere. Enough is enough. Things have reached a point where we can no longer observe quietly and where we must reconsider all the rules that have been fabricated. Despite that we have confirmed that we are the people of one state and a shared life,” he said. Hariri hinted at stepping down from carrying out this task, in case Hezbollah insists on representing its March 8 Alliance supporters in the awaited government. Hariri has been trying to clinch a deal on a national unity government more than five months since a general election that produced a parliament tilted in favour of Hezbollah and its allies. Hezbollah, proscribed as a terrorist movement by the United States and several other countries , is expected to take control of the health ministry, the most significant cabinet post it has held, and to increase its number of ministers to three from two in the outgoing cabinet. Hezbollah is always the bully that has paralyses the government.